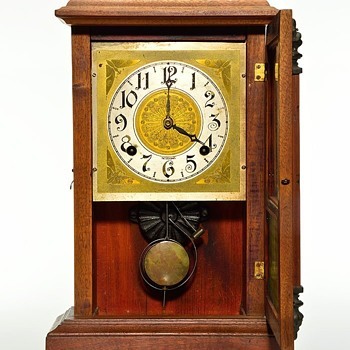 In Furniture > Mission Style Furniture > Show & Tell and Clocks > Sessions Clocks > Show & Tell. Greetings to the CW Community! It's been a long winter. Hope you're able to enjoy the coming spring. After so many years of postings on the board, often, it's not easy to find something which hasn't already been posted here in one place or another. I think we have a unique example of a special Sessions Mantel Clock here. 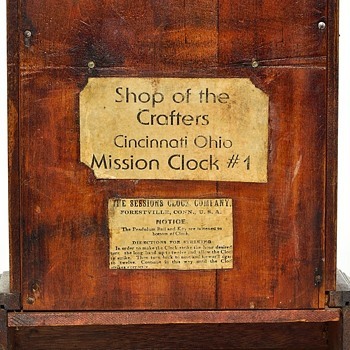 It was designed, and manufactured by "The Shop of the Crafters" of Cincinnati, OH in collaboration with the Sessions Clock Company. We think that it is probably from circa 1902 give or take a few years. The Shop of the Crafters was an Arts and Crafts furniture manufacturer. They produced some quite interesting furniture in the Mission, and later, the Arts & Crafts Styles. An Hungarian by the name of Pál Horti was their designer. As you can see in the photos, our clock is made of a lightly stained oak, as many "Mission" pieces of furniture are. It's very box-like and the face is framed by two half-columns with torch finials top and bottom. 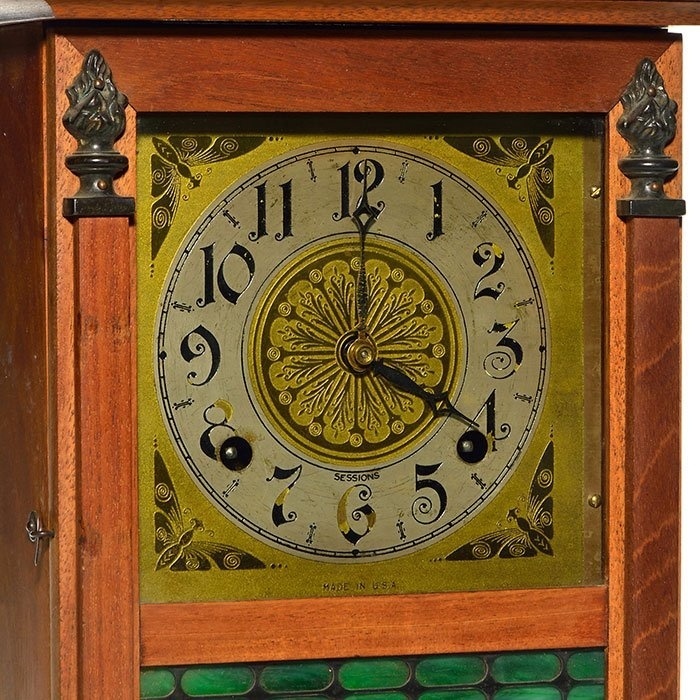 The face or dial has stylized Butterflies or Moths stamped on all four corners which we think is a nice, understated touch. 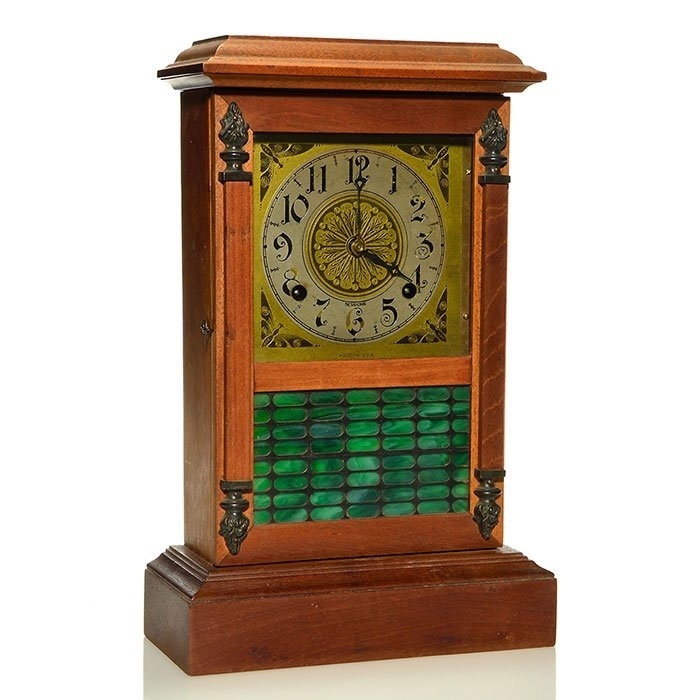 Below the face is a beautiful piece of opaque stained/marbled glass which we think really goes well with and contributes to the color and style of the clock. 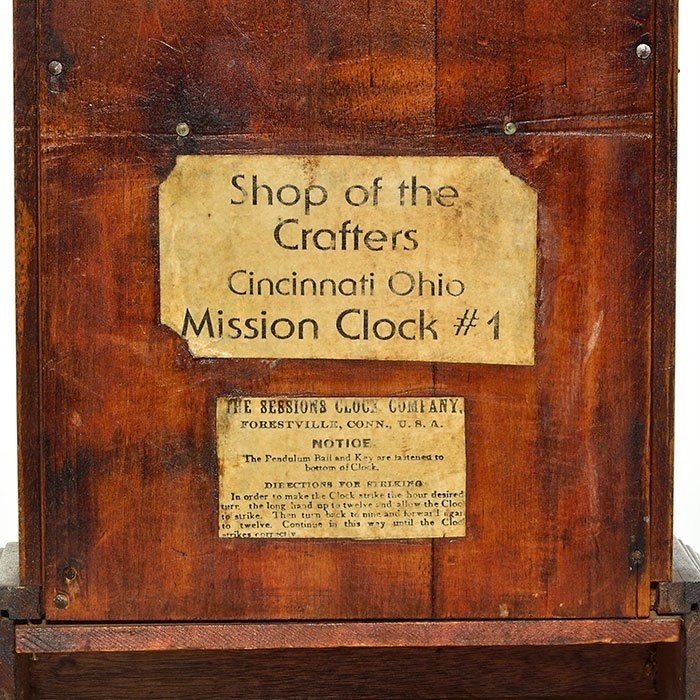 Although we took note of and liked the look of the clock, we generally don't collect "Mission" Clocks so we had not intended to bid on it. Fortunately for us there wasn't a lot of interest in it at the auction. You won't find it in any Collectors' reference books and not a lot of information was out there about "The Shop of the Crafters" when we acquired it in June of 2016. The Sessions movement is complete and in good shape as is the rest of the case. We got lucky. It was one of those little opportunities which can make auctions fun to sit through. We hope you have enjoyed our little one and only Mission Mantel Clock. Thank you for the "loves"
Glad you enjoyed the post. Much appreciated. 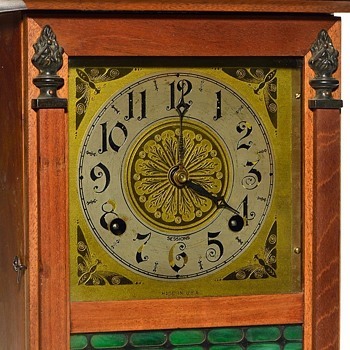 What a lovely old clock! Thank you all for stopping by and clicking that "Love It" button. Very happy to know that you've enjoyed seeing and reading about our Sessions. Thank you Roycroftbooksfromme1 for you kind remarks and your "Love It"! Glad you both enjoyed the posting. OOOhhh! I have something very similar to this but is from Germany. It makes the most beautiful and soothing sound with the chimes. The key is there too! Love it! Thank you for the "Love It" and for your kind comments shareurpassion! You should post your clock too. We would love to see it.